In the days building up to the 60th Wootton Talk on February 7th, there had been apocalyptic weather, with widespread and rain and flooding – so it was quite appropriate that our landmark speaker should be Sally Kettle, who has entered the record books as the first woman to have braved horrendous weather and row across the Atlantic twice, from east to west, including once with her mother, which followed years of arguments and silence. With no rowing (or even sea-going) experience, Sally told us her first attempt to cross the great ocean was in the Woodvale Atlantic Rowing Race in 2003 with an ex-boyfriend, Marcus “Tommo” Thompson, when they set out from La Gonera, in the Canary Islands, in a state-of-the art rowing boat, called Calderdale. Before the attempt, Sally and Tommo had undergone extensive training, including astro-navigation and using VHF radio, and the planned food for the voyage included £500 worth of dried chilli con carne and a range of dehydrated puddings and powered energy drinks. Sally's emotional parents had bid them farewell and she was filled with dread and sobbed quietly behind her sunglasses but – within just six days – they had to pull out of the race because Tommo developed extreme sea sickness. 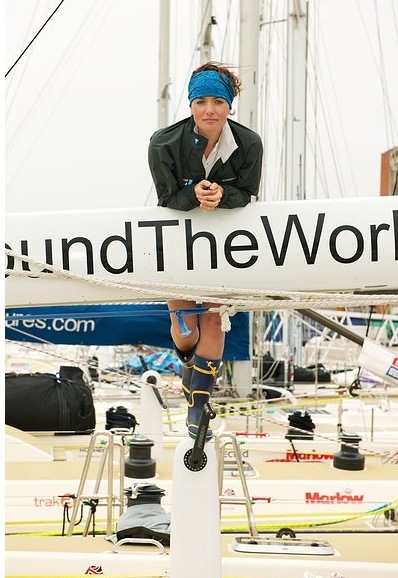 After returning to the UK, Sally was determined to have another attempt and planned to enter the Ocean Rowing Society Atlantic Regatta, starting in January 2004 – again in the boat, Calderdale. She subsequently pulled off the miracle of persuading her mother, Sarah, to join her in this second attempt to cross the Atlantic. After years of not speaking, they set off from the Canaries and – whilst often exhausted and debilitated - experienced the wonders of the ocean, marvelling at whales, flying fish, sea turtles, sharks, night-time phosphorescent algae and even one bird which stayed with them for over 2,000 of miles. Whilst rowing, they passed the time playing games, such as eye-spy, and reading stories to one another at bedtime. Although physically isolated, Sally and her mother had a plethora of communication equipment and could even send e-mail progress reports back to the UK, as well as calling home every Sunday on a satellite-telephone.. But the constant work. including long stints through the night heading for Barbados, took a huge toll and both of them spent long periods of time sobbing. After 105 days, they finally landed on the island, having rowed nearly 3,000 miles across the Atlantic Ocean and raised £250,000 for an epilepsy charity – but, importantly, Sally told us that it brought them together to reconcile their past and they became the first (and still the only) mother and daughter to have rowed across the Atlantic. Sally and her mother were one of only three teams that made it into the harbour on Barbados without needing a tow or a rescue – and they pulled perfectly into their mooring – “Who said women can’t park?” Sally asked us. The impact of the lush greenness of the land after over hundreds days at sea proved overwhelming – and both Sally’s father and Tommo (hugely disappointed at the outcome of his own attempt) were there to meet them, as well as her mother’s brother, Brian, who she hadn’t seen over 20 years. Their story went global and they were even interviewed by CNN in the United States and Sally subsequently landed a job as a producer with Radio Northampton. However, she was not finished with the Atlantic. She subsequently skippered a four-woman team, called Team Rowgirls, in the Atlantic Rowing Race - founded by Sir Chay Blyth and first held in 1997. They aimed to both raise money for a Cornwall-based charity, called Shelterbox, which organises equipment for the homeless in disaster areas - but she also wanted to win the race in record time. Twenty-six teams set out, including one with Ben Fogle and James Cracknell, and also a rival women’s team, which they dubbed the Guernsey Milkers. But Sally's team found the rowing gruelling in 40-feet high waves and the woman were often unwell, and, worst of all, the rudder broke and became detached. One of the Rowgirls was injured during a fall on the boat and, despite rallying, was finally taken off the boat by a rescue-yacht - so disqualifying them from the race. Even so, Sally and the remaining two women made it to Antigua after 77 days at sea but - because their families still had to arrive to greet them - they became the first ocean rowing boat in history to try and stay in the ocean longer than everybody else. The Rowgirls raised £30,000 for Shelterbox, enough to buy 60 boxes which would provide shelter for at least 600 people.